The flag of Adıyaman (photo) is white with the municipality's emblem in the middle. "Belediyesi" means "Municipality". 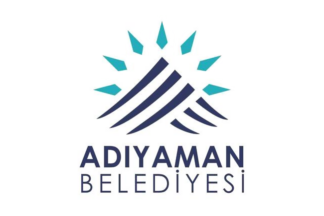 The former flag of Adıyaman (photo) was white with the municipality's former emblem in the middle. Crowning one of the highest peaks of the Eastern Taurus mountain range in south-east Turkey, Nemrut Dağ is the Hierotheseion (temple-tomb and house of the gods) built by the late Hellenistic King Antiochos I of Commagene (69-34 B.C.) as a monument to himself. The Hierotheseion of Antiochos I is one of the most ambitious constructions of the Hellenistic period. Its complex design and colossal scale combined to create a project unequalled in the ancient world. A highly developed technology was used to build the colossal statues and orthostats (stelae), the equal of which has not been found anywhere else for this period. The syncretism of its pantheon and the lineage of its kings, which can be traced back through two sets of legends, Greek and Persian, is evidence of the dual origin of this kingdom's culture. The first emblem features the Roman bridge erected over river Cendere. The Roman bridge at Cendere was built in the last years of the second century, after the emperor Septimius Severus had defeated the Parthians, had captured Ctesiphon, and had added Mesopotamia to the Roman Empire. The old line of defense works along the Upper Euphrates was no longer necessary. The area was reorganized and the river Chabinas (the modern Cendere Suyu) was bridged by soldiers of the Sixteenth Legion Flavia Firma. The flag of Yaylakonak (photo) is white with the municipality's emblem in the middle. "Belediyesi" means "Municipality". The today's university encompasses 12 Faculties, 3 Institutes, 6 Vocational Schools and 3 Schools. The flag of ADYÜ (photo, photo, photos, photo, photo) is white with the university's emblem. The emblam is simple, universal and harmonious, representing the place, the country, and science. The crescent is a symbol of independence and freedom, as a guide through darkness. It is also a symbol of knowledge, lore, virtue, justice and love. The position of the crescent (upwards and tilted at 45 degrees) is a sign of continuous development and ascension. The Adıyaman tulip is an endemic plant representing the region. It is also rich in historical representations. The emblem features two tulips made of water drops. The water drops recall the past of the region and town, which were settled by water civilizations. As a whole, the emblem represents the merging of virtues and cultures; the different shades of blue represent coexistence in the past and present. The Adıyaman tulip (internationally known as Persian lily or Persian bells), Fritillaria persica L., grows natively over a large range: from southern Turkey to western Iran, and as far south as Israel and Jordan. The Adıyaman cultivar (horticultural variety derived from a local wild plant) is prized by gardeners for its purple bell-shaped flowers. Four similar logos, created by professional designers, were submitted to the public from 12 to 16 October 2015. Proposal No. 1 was eventually adopted as the new logo of the university. Proposals No. 2, 3 and 4 all have the crescent pointing upwards. Proposal No. 2 features only one tulip, pointing upwards, while proposal No. 4 features the same tulip, smaller in size and pointing downwards. Proposal No. 3 features the same tulip as proposal No. 1. The first flag of ADYÜ (photo, photo) was white with the university's first emblem. The emblames features, on a grey disk, a triangle representing Mount Nemrut (Nemrut Dağ). ATSO (website) was inaugurated on 1 April 1984. The flag of ATSO (photos, photo, photo, photo, photo, photo, photo) is white with the organization's emblem in the center.